This is it - the 17th of May, 2010. Thirty years ago to the day that Mossley the town virtually emptied and Mossley the team took to the pitch at Wembley Stadium for the 1980 FA Trophy final. It's actually quite frightening to think that three decades have passed since we did battle with Dagenham for the right to climb those 39 steps and hold the trophy aloft. Not only because the events of the day are still as fresh in the memory as they were back then, but because it really makes you feel your age as well! Mossley's appearance in the final meant that the town's carnival, due to take place on the same day, had to be postponed for a week but it didn't stop the locals from taking to the streets as they would have done had it gone ahead. Instead of lining the roads to watch the procession of floats and bands though, almost everyone to a man, woman and child converged on Mossley station or the market ground: a sea of black and white waiting to be carried to London on one of the many specially chartered train services or the seemingly never ending line of coaches. My journey south was on one of the crowded trains (a trip that seemed to pass in the blink of an eye) and along with the walk to the stadium in the Mossley jacket my mum had made for me, the atmosphere both inside and outside the ground, the hairs on the neck raising rendition of Abide With Me, the teams emerging from the tunnel and other moments far too numerous to mention... they're experiences that will live with me until either the day I die. Or when senility finally takes over - whichever comes first really. Yes, that's me in the top left photograph in my little red Mossley jacket. The other photos were taken by my dad as the teams made their way onto the pitch. In fact the only void in my memories of the day is the match itself. I remember Ian Smith equalising, or rather the roar as he did so, and a few other incidents but the combination of being tiny and the stadium's infamously poor sight lines meant that my view of the match was often obscured by the people around us. As we all know too well though the final proved to be a game too far for the Lilywhites - not that they didn't make a damn good go of achieving a league and cup double. And that's not some rose-tinted nostalgia talking, as the reports below say we were genuinely unlucky not to come away from the old Empire Stadium with more than just losers medals and memories. If you only have the time or desire to read one of the following scanned cuttings, I suggest you choose the first one - 'Walking tall from defeat' - as it's the one that was published in the Mossley & Saddleworth Reporter and, as a consequence, a bit more emotive than the others. That's not to say the rest (reports taken from the national tabloids) aren't worth reading because they are and all have some kind words to say about the Lilywhites. If I'd been older I'm sure the defeat would have hit me harder than it did but I went home in just as happy a mood as I'd arrived in. In fact there weren't that many overly sad faces in the carriages as we made the journey north. Maybe it was because everyone thought we'd get the chance to do it again the following season? Sadly we didn't, a defeat at Bangor City in quarter-finals of the competition ending our chances of making it to Wembley for a second successive season. Even now, thirty years on, there's still the hope burning in some fans that we'll get the chance to take to the pitch at the national stadium again. And though it's a situation that's unlikely to happen given the way the non-league game is set-up these days, it is what dreams are for. The fifth and final part of this look back will be online soon and detail the teams homecoming along with more words and pictures about the Final weekend. 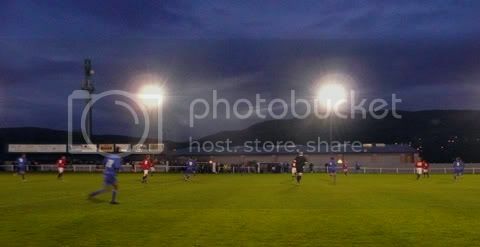 Ten months after it began on a sunkissed afternoon in Dukinfield, the 2009/10 season came to an end for Mossley80 on a cold night in Glossop. And thankfully it was a decent end too as the unbridled misery and boredom of the last two games witnessed were brushed away in a flurry of end-to-end football (well, mostly the end Glossop were attacking) in the Vodkat Reserve League Cup Final. 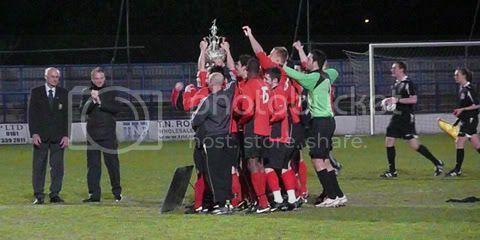 Yes, a reserve team cup final - we were that desperate for a game of football. You know its going to be a good game when there's a goal after only 25 seconds and that's how long it took Glossop to take the lead. They kicked-off, ran forward and scored - as simple as that. A second was not long in coming and there should have been another four or five added to the total before the interval. It was a game the description 'one-sided' was invented for. The second period looked to be heading down the path signposted 'Foregone Conclusion' until, much to what I should imagine was everybody's surprise, Padiham pulled a goal back. Whether it should have stood or not can be argued about for a long time (there were at least three fouls committed as they worked the ball up the pitch) but it certainly made the game that bit more interesting. It could have gotten even more interesting had Padiham hit the net and not the crossbar from a yard out on their next attack. The referee stopped play so a Glossop player could receive treatment for an injury. From the drop ball to restart the game, a Padiham player kicked the ball towards the Glossop keeper who missed it and in doing so allowed it to roll into the net. Rather than a goal though the referee awarded a goal kick. Now I'm not going to say he made the wrong decision, purely because I don't know and I can't find the definitive answer to the situation anywhere. Therefore if you know whether it was a correct or incorrect call, please don't hesitate to share your knowledge of the rulings which cover this infuriating game we know as Association Football. After much discussion about the weather, holidays, the awfulness of prime-time television and how some of the players in the Glossop side would not look out of place in the Hillmen's first team (and could fit rather nicely into Mossley's starting eleven too) the final whistle blew and the season was over; another year of football done and dusted with. Of course there's still the World Cup but it's no real substitute for standing on a wind and rain swept terrace in the back end of nowhere, watching a game of football so poor that you contemplate committing seppuku with a corner flag pole, is it? Having only just grown accustomed to not seeing Mossley's floodlights dominate the skyline after their well documented losing battle with the winter weather, it looks like I'm going to have to start getting used to another view. Thanks to the numerous fund raising events and the grateful donations of many, many good people, the club is (warning - bad pun ahead) literally beginning to put the dark days behind them as the pylons for the new lights are now up. It's not the greatest photograph in the world I'll readily admit but hopefully there'll be some better pictures to follow when time and the weather conditions allow. And so ends a week of diminishing returns. What began with a mesmeric meeting between New Mills and Newcastle and took a near vertical descent in quality with the Vodkat League Cup Final, finished back in the High Peak with New Mills and Squires Gate playing out a game of football so spectacularly dull that it almost cured my insomnia. Never before has a 0-0 scoreline so accurately reflected a match. It would be remiss of me not to mention that both sides had a couple of half chances but for the most part the game was as lifeless as the back benches in the House of Lords. Although I'd wager that you'd see more dribbling there in the space of ninety minutes than you would have done at this game. The only incident that sticks in the mind (and unfortunately my handkerchief and coat) is the sudden pre-match nose bleed I had. And it comes to something when your nose literally bursting in a fountain of blood is not only the highlight of the day but more fun than the match too. In brief then, the past week of viewing NWCFL games goes as follows: excellent game -> bad game -> worse ga... Zzzzzzz! It's a sequence which doesn't exactly bode well for the next game the 'ever desperate for a game of football' Mossley supporters will be taking in on Monday night. That said though, the masochist in me is keen to see just how bad things possibly could get. Following the delights of last weekends top of the NWCFL table clash between New Mills and Newcastle, the Vodkat League Cup Final held at Curzon Ashton gave the same small but intrepid band of Mossley supporters the chance to sample the kind of fare that was on offer at the opposite end of the division. Would we be treated to some similarly sparkling football or be witness to something else entirely? Well it turned out to be something else and not a good something else either as we went from the sublime to the sub-standard in the space of five days. I'm not saying it was bad but... no, it was bad. Very bad. Actually I don't know why I'm surprised at the poor nature of the match given the type of season both sides were having. Winsford were sitting fourth from bottom of the league while their opponents, Abbey Hey, were actually rock bottom and playing their first game since being condemned to relegation. Not exactly omens for a great game. The warning signs that things would be slightly rubbish were increased when the sides were introduced to the guest of honour, Eric Tate, before kick-off. What do you mean you've never heard of him? It's the Eric Tate, the assistant manager at Northern League side Tow Law Town. Yep, that's right, the V.I.P. for the Vodkat League Cup Final was the second in command - not the actual manager but the assistant - of a mid-table club in an equivalent league. Goodness knows who their back-up choice was should Mr Tate not have been able to make the game. Armthorpe Welfare's coach driver? The window cleaner at Bishop Auckland? And all this was done to a backdrop of wrong announcements and terrible mispronunciations over the p.a. system which, as you can imagine, (despite being par for the course at the Tameside Stadium) really added to the prestige of the event. Although I had gone to the match with the intention of being neutral, my support swung behind Abbey Hey for two reasons. The first being the presence in their team of three ex-Mossley players (John-Paul Lewis, Gareth Wager - who was probably man of the match - and Matthew Kemp) and the second reason because they were the only side who attempted to play some football on the night. The first half was memorable only for the one goal scored in it. A rare outbreak (i.e. the only bit) of quality football opened up the Winsford defence and gave Abbey Hey a lead which they carried into the interval without too much duress. No, scratch that, under no duress whatsoever. The second period was marginally better, down purely to Abbey Hey raising their game a couple of notches rather than anything Winsford did, and two more very well worked goals gave the Gorton based side an unassailable lead. I appreciate that it isn't a pleasant epithet to label a team with but Winsford were laughably bad. Being in the company of their fans though, we tried to keep our amusement in their on pitch endeavours in check but with fifteen minutes of the match remaining we couldn't stifle the giggles any more. For the first time in the match United's number nine found himself goal side of the Abbey Hey defence and only the goalkeeper standing between him and the chance to give his team a glimmer of getting back into the game. With glory awaiting he swung his leg, missed the ball and almost kicked himself in the head before stumbling around like Norman Wisdom in search of Mr Grimsdale. Winsford were by far and away the worst side I've seen on my travels this season and by some considerable distance. Admittedly they've had something of a fixture pile-up recently but if you can't raise your game just one iota for a cup final it's a sign that football isn't the sport for you. Still, it was an entertaining match in a way (if for the wrong, wrong reasons) and marginally better than not only last seasons final, but the one seven years ago at Gigg Lane when when we beat Clitheroe 2 - 1 to lift the same trophy. Maybe my lot in life is to never see a good final again? If it is I think that in the grand scheme of things it's something I can live with. I would though like to end the season with a reasonable entertaining game to carry me through the summer months so hopefully Saturday's fixture between New Mills and Squires Gate will do just that. The emphasis of course being on the word 'hopefully'. Just like last year, the early end to the Northern Premier League season saw a small group of Mossley supporters head off to strange pastures in search of football. 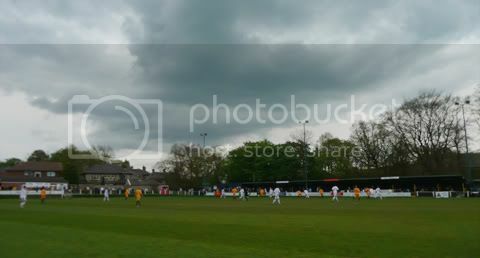 And just like last year they ended up in the High Peak, or to be more specific New Mills, where the eponymous home town team were taking on Newcastle Town. Ninety nine percent of the time a fixture at the tail end of the season involving the teams in first and second place would be must-see games full of tension and potential high drama. This though, thanks to Newcastle running away with the league and being crowned champions several weeks earlier, represented that other single percent where all that was at stake was pride. However, the fact that there absolutely nothing riding on the outcome didn’t stop it from being a genuinely good game to watch from a neutrals perspective. Well, for the most part it was. There was a slump around the hour mark but compared to some of the games I’ve witnessed since August, particularly the Curzon-Colwyn Bay play-off four days earlier, this was ambrosia – the stuff the gods were fed with and not the rice pudding. So, the game. Newcastle took an early lead when a sublime move up the pitch end in the most ridiculous of goals; the ball taking what seemed like a dozen deflections before ending up in the back of the net. The lead was a just reward for the Staffordshire sides great start to the match but they were pegged back when the assistant referee was kind enough to give the Millers a free-kick for a non-existent foul, from which Carlos Meakin headed them level. New Mills' good fortune continued when their number five only received a caution for bringing down a player in the box. It was as blatant a red card offence as I've seen all season yet the referee (as is often the case at this time of year when their eyes are on holidays and not on filling out reports) only saw fit to issue a yellow. Newcastle's pre-interval misery was then completed by the penalty taker not only blasting his spot kick straight at keeper Liam Higginbotham (see, I know one players name) but knocking the rebound ten metres over the crossbar with the goal at his mercy. The second half began with both sides piling forward in search of the goal that would put them in front but then came that aforementioned slump. It wasn't a gradual thing either - the quality of the game just went into a straight nose dive. Thankfully it picked up again towards the end and the Millers had Higginbotham to thank for keeping the scores level as the visitors bombarded his goal with shots. Conclusions that can be drawn from the game? The over riding one is that I'm glad Newcastle will be in the Unibond, sorry - Evostik South next season. Seriously, they're that good a side and if they can keep their squad together I don't envy anybody playing them at all. New Mills are a decent team too although not quite as formidable as Town and that's mostly down to their strike force who in this game posed all the threat and menace of a particularly wet lettuce leaf. Even the introduction of ex-Football League striker Simon Yeo didn't improve things any. At least not in terms of goal potential but he did up the quotient by falling over the ball. Twice. Of course I'm basing the above opinion purely on the strength of one match but as it doesn't stop supposed 'experts' in the media, it's not going to stop me either.